Today I'm sharing the big reveal for the final transformation in my "Help with YOUR DIY" series: Sadie's Vintage Dressing Table with Mirror. This piece is a little different because, instead of helping her to paint this piece, Sadie commissioned me to paint it for her. If you were wondering whether I'm available to custom paint furniture, the answer is absolutely, Yes! If you're interested, send me a message and we can discuss details. 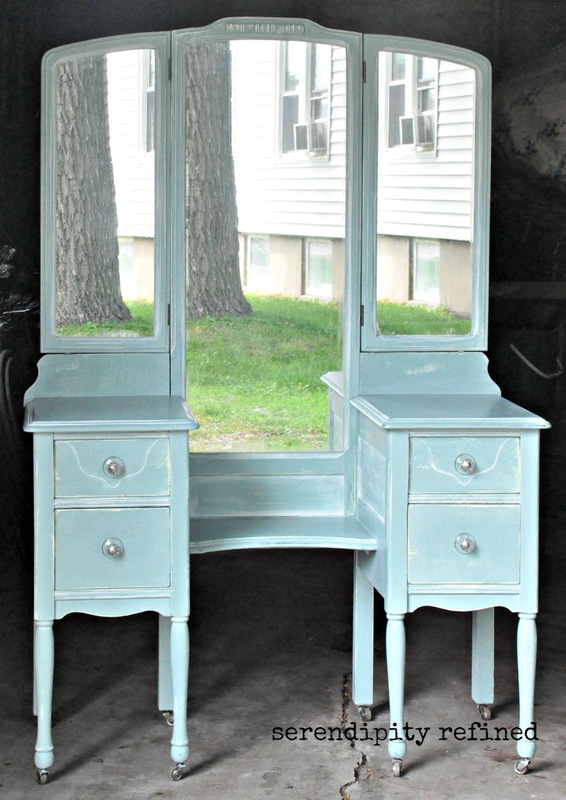 This beautiful piece was an early May roadside rescue. Sadie told me about it even before I decided to do this series. 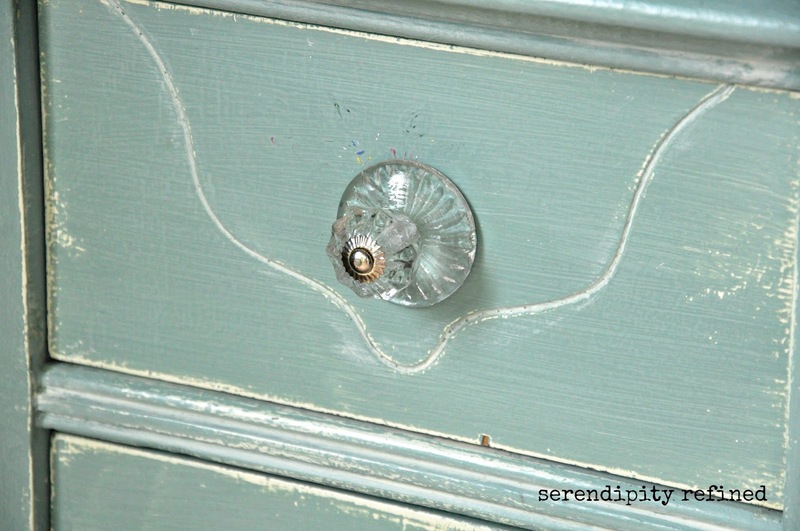 She knew that I'd love the lines and the shape of the piece and she trusted me to transform it into a piece that she could use in her upcoming bedroom remodel. 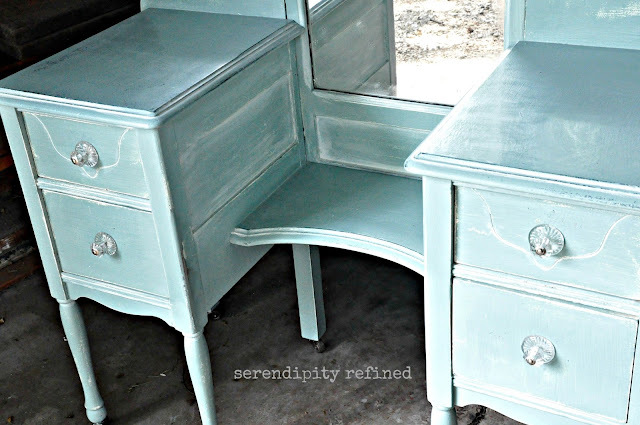 Of course, she was right...I love the piece and was thrilled to create a one of a kind accent for her home! 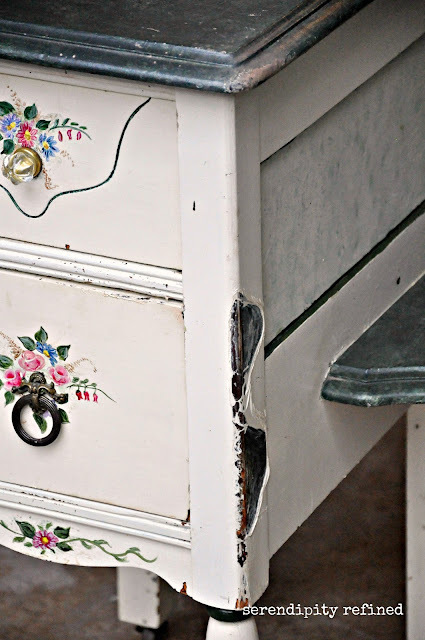 At some point in its life, someone had taken the time to hand paint flowers and to faux finish green marble on the top of this piece. Some time after that, the paint on the front left side was destroyed from what appears to have been heat ...or a chemical like nail polish remover. The other problem was that the screws which held the right side of the mirror in place were stripped and the hinges were bent. Fortunately, all of the parts were still there... including the original wheels. Even the original hardware was in a plastic bag in one of the drawers! I made the repair to the mirror prior to starting on the piece. 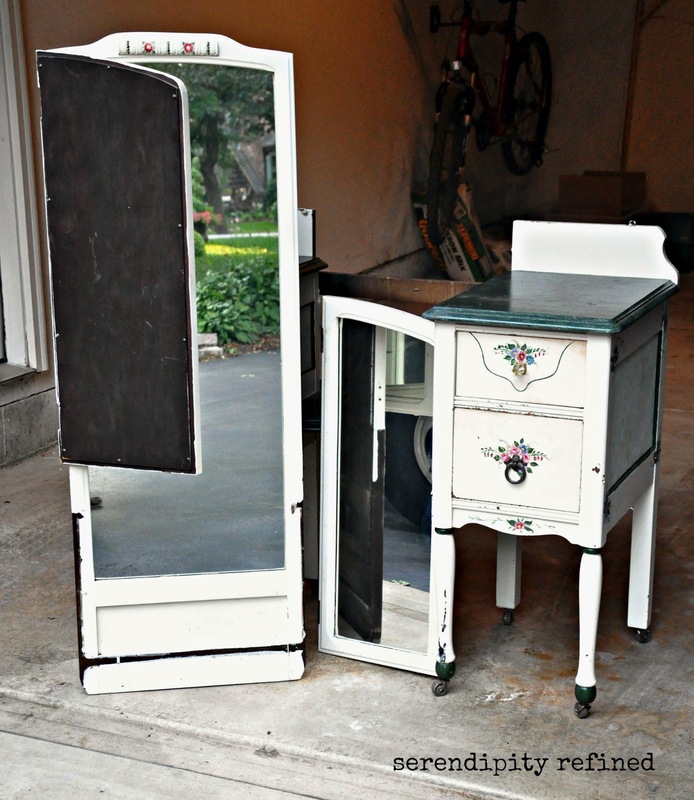 I hammered the hinges flat, then, using my tutorial, I plugged the existing holes with dowel rods, then re-drilled and re-hung the mirror without any problem. 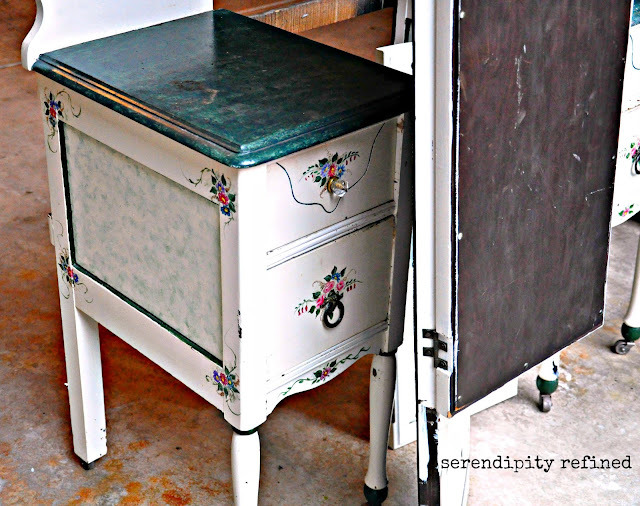 To transform this vintage beauty, I sanded the rough spots and the "melted paint" using fine sand paper. This removed some of the drips and most of the sticky paint on the front of the piece. 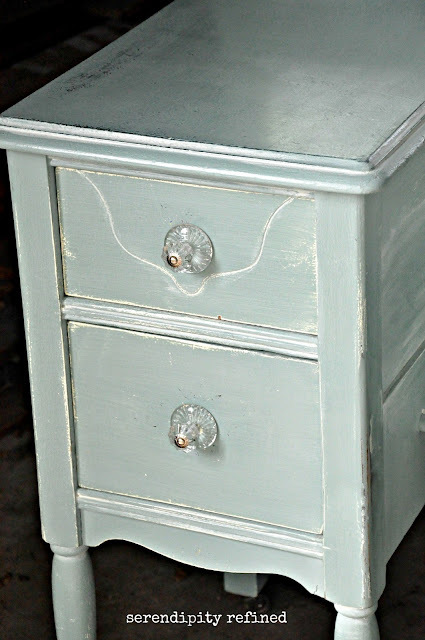 Then, I painted it with two coats of Duck Egg chalk paint and allowed it to dry over night. To give the piece some depth, I thinned ASCP Old White with water to make a wash which I painted on the panels, the insets of the mirrors and the grooves on the front of the drawers. I distressed the piece heavily, using a medium sanding block, until sections of the original white and green paint showed through. Sadie's new bedroom will be an eclectic mix of hand painted and mirrored cabinetry as well as some natural woods so I wanted this piece to have elements that will help to blend the various finishes in the room while preserving the vintage feel of the piece. On the drawers, I used vintage inspired glass knobs which I found at Hobby Lobby. I delivered the piece last night and I'm happy to say that Sadie loved it so much that she's hired me to transform a couple of other pieces that she has...which is a good thing since I was afraid that I'd have nothing to do this week! 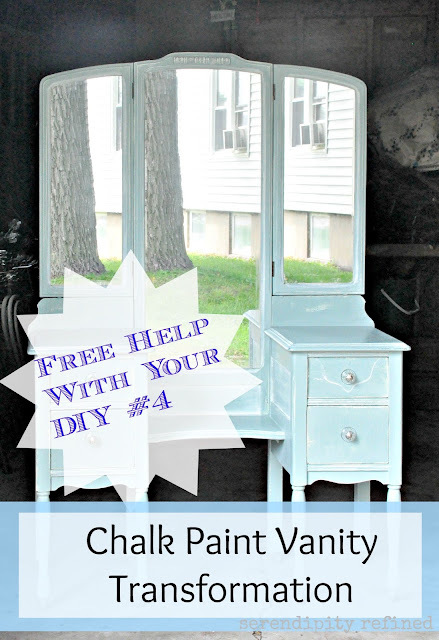 I've still got about 1/3 of a can of Duck Egg chalk paint left over from this vanity transformation, and there's a chair that's calling my name. Have a wonderful week!